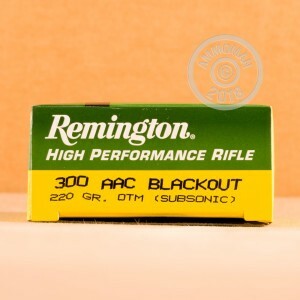 This .300 AAC Blackout ammunition from Remington delivers the excellent subsonic performance the cartridge is known for. Each cartridge in this box of 20 fires a heavy 220 grain open tipped match bullet at 1,050 feet per second. These cartridges are loaded in Lonoke, Arkansas using non-corrosive Boxer primers and brass cases. 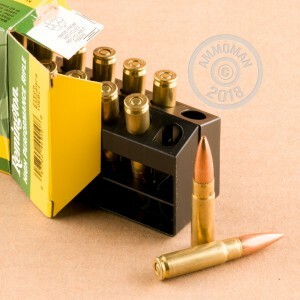 Developed by Advanced Armament Corporation and Remington Defense, the .300 AAC Blackout cartridge is one of the easiest ways to shoot suppressed with an AR-15, as it requires only a barrel change and, unlike .223 subsonic ammo, is usually capable of cycling the rifle's action.